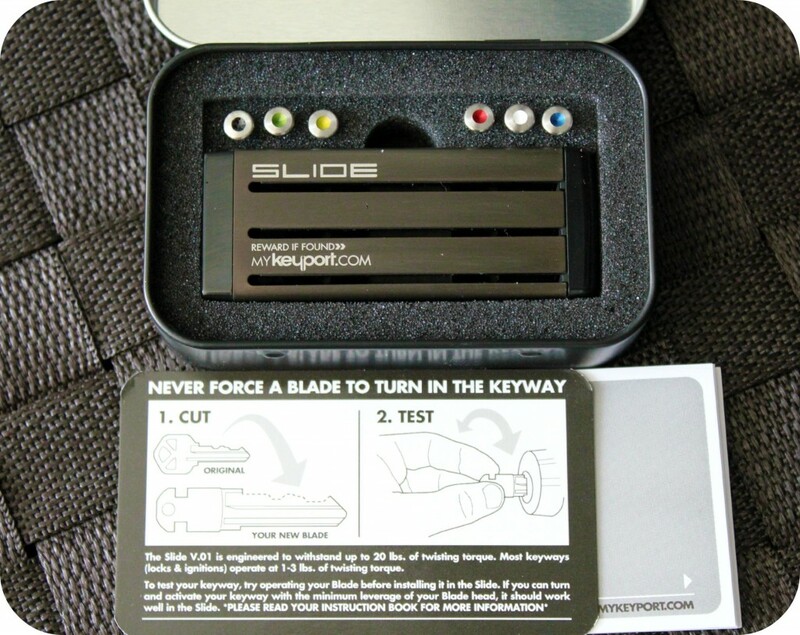 You are here: Home / Product Reviews / For Dad / Keyport: An Innovative Keyring Alternative That You and Hubby Will Love! So, I’m a total techie. I love my gadgets, especially those that make life much more simple. Let me introduce you to one of the most awesome things that I have ever come across and for the last 2 weeks has made such a difference in my life. Well, it’s called a Keyport and I think it’s the neatest thing since sliced bread. So, mamas, you know when you prep about an hour and a half to get yourself and the kids ready for an outing or doctor’s appointment and somehow your alarm decides not to go off and you are rushing? Daddy is at work and the kids don’t want to wake up and when you finally get the kids ready, you’re half dressed–grab your purse, diaper bag, snacks and anything else your kids will need and rush to the van then… With a child on your pant leg and a kid on your hip you have to fumble through your ginormous purse because when you’re a mom–the bigger the purse the better–and you can’t find your keys! Your keys, something that you should have taken out before you decided to carry all that stuff, while you’re shuffling through your huge purse, you still can’t find the keys so you reluctantly have to put everything down. All the while, you need to keep the kids safe while you look for your keys. Alas, you find them and head on your way. Either just making it or your late. All because those darned keys. Well, maybe not JUST because the keys but they ultimately made a bad day worse. Yes, girls, come on–we’ve all had days like these. Well, this is where Keyport comes in handy. I am pleased to say that Keyport and their innovation can help a busy mom like me, not only is super COOL but, it is functional. I have gotten so many compliments and mere shock and awe when they see my Keyport. After the shock wears off they are amazed at how awesome Keyport is. It’s definitely something that I will use long-term. It’s an investment but the features and functionality absolutely outweigh the cost. The great thing is that you can truly customize your Keyport so, the cost is entirely up to you! A Keyport is an innovative keychain alternative that will hold up to 6 keys, it has 6 slots and you can choose which keys go inside. It is Universal and compatible with most keys on the market, including chipped auto keys. In addition to just adding keys to your port you can add USB’s, barcode readers, LED lights and more. For the men in your lives, they no longer need to have a big lump in their pocket that has the potential to stab them whenever they sit down. 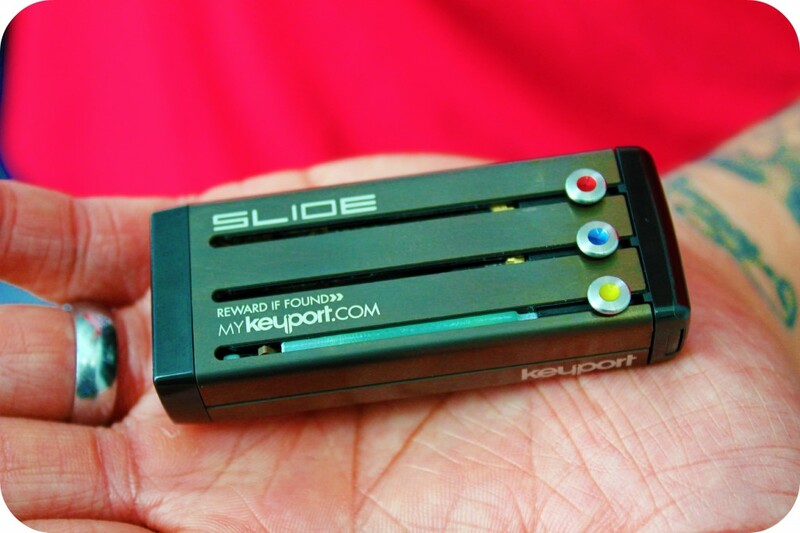 Keyport Slide // Get Ported from theKeyport on Vimeo. It’s so versatile that you no longer need to carry that huge jumble of keys in your purse, you can simply slip the Keyport into your back pocket or even front pocket and just GO. It is so lightweight and compact that some days, I even forget that I have it in my pocket and I have to feel my pant pocket to see if it’s still there. It’s made of polycarbonate and stainless steel so you can bet it’s durable. It’s also lighter than my iPhone and that says a lot. So, how much are you looking at for one of these babies? It really depends on how you customize it– it ranges from approximately $50 and up. Which is so amazingly worth it! So, when Keyport sent me one of my own to design and try out, I was so thankful for this godsend. It is very, very simple to order online and I did it in less than 25 minutes. I ordered a 6 slot keyport with my mini-van keys, 2 cars and an LED light which is so exquisitely fabulous and useful. I chose gun metal and if you want to be fancy, you can even opt for diamonds nodes and mini reelers. I got the lanyard that came with it (which is snug and secure) and controlled my impulse with the diamond nodes, perhaps later, I may just add them. Honestly, it’s made my life a lot easier. I have less bulk and more room in my purse. I don’t have to worry that I’d have to dump all my purse’s contents to find them. I love the fact that I have the choice and I could seriously take the Keyport with me and slip it in my pocket, swipe in to my gym and work out with the Keyport in my pocket. It’s easy to use since you put it together yourself and very quickly, you get used to where you’ve placed your ports and consequently you get to the point that you can simultaneously use your key and LED light. What I find to be most important is that it withstands the torque of twisting when in use. Like I said, it feels like it’s not even there and the LED port is really bright which is so useful at night. As you saw in the picture, you can see the capabilities that Keyport has, when it comes to your house keys, car keys, for the adventurous–motorcycle keys, bottle openers, bar code readers, LED lights and USB sticks in 3 memory sizes! A few things I would love to see is a Keyport with more slot capabilities since the chipped keys take up two slots. Perhaps in the future, a beeping system can be implemented to locate your keys in your house in the case that you misplace them. The programming of the keys was a bit tricky but, I got it following the directions. Lastly, it would be really, really cool to see the ability to customize your Keyport with skins or personal engraving. If you want one of your own, after watching the video, you’ve seen it in action and you see what it can do! By the way girls, this makes for an EXCELLENT Christmas gift for your husbands. I guarantee you that they’ll love it and score you a few retail therapy trips! In fact, Hubby is trying to take ownership of this one as we speak. The team behind Keyport are amazing and you can follow @thekeyport if you’re on Twitter and you can like Keyport on Facebook, here. If videos are your thing, subscribe to Keyport’s YouTube at theKeyport. Would your husband love this as a gift? Previous Post: « I’m Going to #DellCAPCanada Day! WOW! This is an awesome Christmas idea for my hubby, my dad and my mom!!! Thanks! Hello Jennifer! Isn't it just AWESOME? It's amazing how much it can make a difference everyday! 🙂 Let me know if you have any questions! Wow, the keyport is a great idea, I have a few people in mind who it would be perfect for. Just added this to my Christmas gift giving list! this is so cool! i'm not very techie myself but i would so love to have this! I actually bought two of these myself, one for me and one for my boyfriend, and I love it! It's so convenient, especially because I would lose my head if it werent attached to my body. 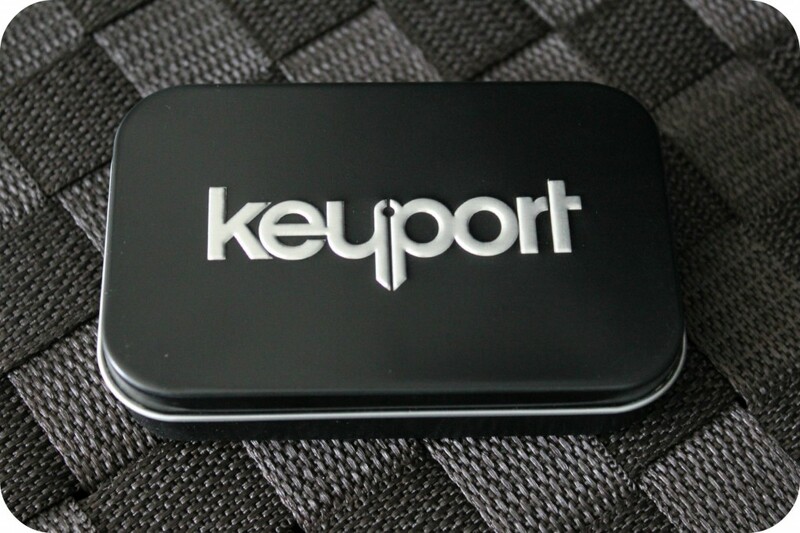 The keyport would be perfect for me, and it's stylish as well. you should totally get the hook up and do a give away! i agree this is really cool. hopefully my wife gets me one for christmas! I'm going to get one for Hubby, shhh–don't tell him. LOL. He doesn't come by often so it's safe. Haha! Wow that's really neat! Unfortunately our car key is one that has a chip in it so I don't think it would work. But I love the idea. They actually accommodate chipped keys! My van has a chipped key and it works well. 🙂 Hubby loves it. Looks like a great gift idea! Thanks for sharing! Definitely guys and gals love their gadgets! O.O This is really great! I have never seen anything like this before!! Wow! It is a great way to keep them together.